This walk: 2012-4-17. River Avon, Japanese larch possibly infected with Phytophthora ramorum, unhealthy nearby Rhododendron (ponticum? ), laurel, Brent Moor House Memorial, Shipley Bridge, C-stones. River Avon in spate after a short period of rain, and this just after a Devon and Cornwall drought was announced the previous day. River Avon after a little rain, during an official drought! The story of the new tree disease in Cornwall can be heard in this 24-minute BBC iPlayer item. Some Devon and Cornwall web page information about diseased trees (look down the page somewhere). A spot where several large conifers were felled some time ago. Rhododendron, new growth with spots already? Remains of an old wall at Brent Moor House covered by tree roots. Another look at the conifers. The Brent Moor House Memorial: this bears an inscription to Margaret or Mary, daughter of Francis Meynell who died, aged 4, after a riding accident. The inscription is almost illegible and the text below has been deciphered with reference to a Geocaching web page and to the Dartmoor Magazine, Issue 102, Spring 2011, pages 14-16. The inscription appears to be in all capital letters. The Vanneck Family Tree web site has Mary born 9 October 1858, died 27 March 1863, aged 4. Father - Lt. Francis Meynell RN, Mother - Caroline Strathan Brown 1822-1897, Sister - Ida Meynell 1860-1946 (my birth year! ), Brother - Edward Meynell 1864-? The Geocaching web page has the little girl's name as Margaret and the date as 1865, The Dartmoor Magazine has the name as Mary and the date as 1863. Apparently, while the spot is now gloomy and overgrown with evergreen shrubs, Rhododendron and Laurel, it used to be brighter with a lily pond below. Eric Hemery (1983), High Dartmoor, Robert Hale, London, page 328, says: "Near, and just inside the lower gateway, a stone pedestal now overhung by a fantastic, nightmare tangle of overgrown shrubs, stands to the memory of the young daughter of the Meynells who was tragically killed in a riding accident in March 1865". Click HERE to see a larger image and HERE to see an even larger image. C-stone 100 yards east of Shipley Bridge. 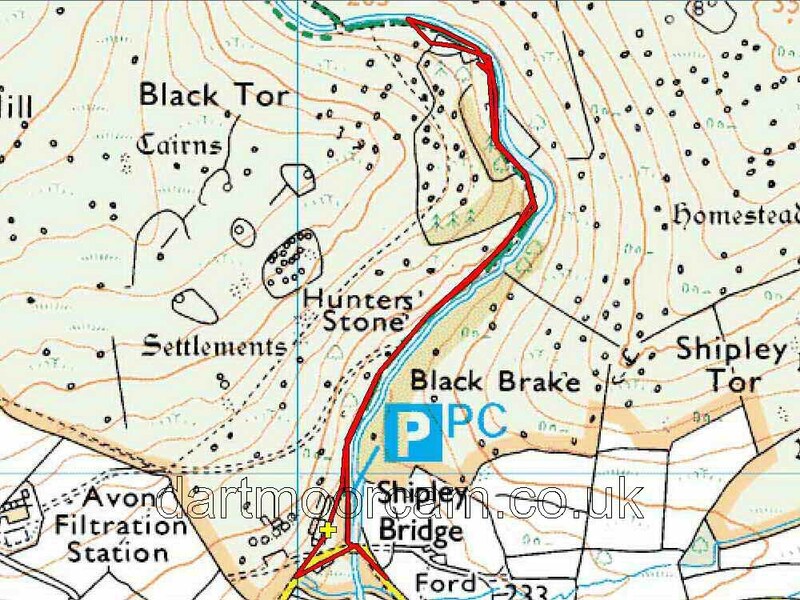 These are described by Dave Brewer (2002) Dartmoor Boundary Markers, Halsgrove, pp. 217-219. Essentially, from 1841, these stones were erected in Devon to signify that the county adopted responsibility to maintain the bridge and the stones were set 300 feet either side of it. Shipley Bridge with the old Brent Moor (Shipley Bridge) china clay works in the background (see 9th Feb. 2012 for details). C-stone 100 yards west of the bridge, almost totally subsided into the ground. This walk was reached by exiting the A38 at South Brent (Exeter side) at the exit for Avonwick, Totnes and Paington. Drive north from the roundabout up towards the moor, straight across Harbourneford Cross, left at Gingaford Cross, pass a road going off on the left, follow the road to the car park at Shipley Bridge, marked by the P symbol and yellow cross on the map.